Called “the most loyal fans any baseball team could ever ask for”, the Bleacher Creatures is a group of die-hard New York Yankees fans who will stop at no one and at nothing to cheer for their favorite baseball team of all time. 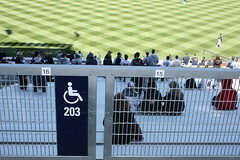 They used to be found in section 39 and sometimes, 37 of the old Yankee Stadium, but just recently, they moved to Section 203 of the new Yankee Stadium. Their loyalty and firm allegiance to the New York Yankees and their harshness towards opposing fans have made them a feared and respected group in the stadium by other baseball fans and the opposing team’s supporters but at times, acclaimed for being a Yankee player’s most favorite group of people. Bleacher Creature tradition started sometime in the 1980’s and 1990’s when the tides were turning against the Yankees. The only two things that remained loud and grew louder and stronger were the Bleacher Creatures’ roll calls and cheers that provided the Yankees with moral support. Ali Ramirez, the forefather of the Creatures’ tradition would ring a cowbell to catch the attention of the other supporters and would lead them into cheering. When he died on the 9th of May in 1996, little did he know that his legacy would enforce the most loyal group of fans of all time. Today, the Bleacher Creatures are getting ready for their move to Section 203 in the New Yankee Stadium and once they are there, get ready for more roll calls and more cheering. Opposing teams beware, the Bleacher Creatures won’t stop cheering on for their favorite baseball team and if you find yourself near them, get ready for some heavy jeering—they won’t stop till you get their message. Before he was a pitcher, long before he entered the record books, long before he made 54 homeruns as a Yankee, and long before we turned him into a chocolate bar, he was just Babe Ruth- ex-Red Sox outfielder. Babe Ruth, born George Herman Ruth, Jr., also known as “the Sultan of Swat” and “The Bambino” was a top American Major League baseball player, famously known for playing for the Yankees as an outfielder and breaking record after record in his time. Being the first ever player to hit 60 home runs in a single season (1927), Ruth became a baseball superstar overnight and a larger than life sports icon throughout history. Babe Ruth first played for the Baltimore Orioles; however, as the fame of free agency grew, he was sold to the Boston Red Sox until he was eventually bought by the New York Yankees in the 1920’s. His transfer was the Yankees’ greatest bane and the Red Sox’s worst boon since little did the latter know they would not be winning a single championship for the next 86 years. Now with the Yankees, he made 54 home runs and batted .376 on his first year with his new team. The next year, he, along with his team mates made Yankee-history by winning their first ever league championship. Ruth’s display of continuous home runs and amazing records transformed the face of baseball from being the “inside game” to the “power game” from then on. The Yankees eventually moved onto the World Series in 1921 and with Ruth in their lineup, they were able to win the first two games; however, things turned badly for Ruth and his team when he fell into a series of mishaps. Although they lost the 1921 World Series, Ruth still managed to redesign history in 1923. 1923 was a great year for the Yankees due to the construction of the Yankee Stadium, which was also named, “The House That Ruth Built.” Ruth once again gave the Yankees another victory by leading them to the championships on their first game in the stadium. Also, on the same year, they battled the New York Giants once again for the World Series, and this time, Ruth did not let victory run past him. Ruth walked eight times, batted .368, gained 8 runs, slugged 1.000, and scored 3 home runs. Eventually, they won their first World Series by 4 to 2 games. Babe reached the height of his career in 1927 when he made a record of 60 homeruns in a season of 154 games, and became the first person to do so. The next few years proved difficult for the Yankees as well as for Ruth. In 1929, the Yankees were unable to return to the World Series and it would take them another three years to regain their momentum. However, he was still able to win various games with the Yankees and make records. Baseball aficionados, kids, teenagers, and adults, male or female, still look up to the man who reinvented the face of baseball. Indeed, baseball would not be as grand as we regard it to be had not Babe Ruth entered the fields. Hence, hats off to the Greatest Baseball Player of all time: Babe Ruth! Hey there! Welcome to Yankees4Life.com, Your No. 1 New York Yankees Authority. Find information about your favorite pitchers or outfielders, the latest on the Yankees current games, a schedule of their next games, and even Who’s sitting Where in the Yankee Stadium! We’ll cover everything you need to know about the number 1 baseball team of all time, that’s for sure. Scores, commentaries, opinions, random ramblings, images, videos and headline Yankee news are all here carefully hand picked just for you. Tune in daily to get the best about the New York Yankees and never be left out from the crowd again. You don’t have to be a Bleacher Creature to show your allegiance to the best baseball team of all time.